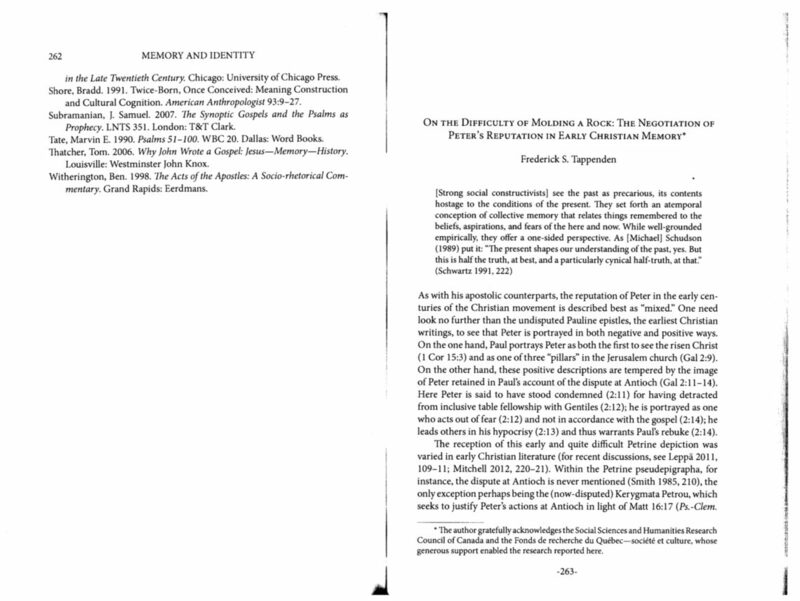 “On the Difficulty of Molding a Rock: The Negotiation of Peter’s Reputation in Early Christian Memory.” Pages 263–87 in Memory and Identity in Ancient Judaism and Early Christianity: A Conversation with Barry Schwartz. Edited by Tom Thatcher. SemeiaSt 78. Atlanta: SBL Press, 2014. This paper explores the development of the apostle Peter’s reputation in early Christian memory. Attention is given to three distinct images of Peter—two that are relatively early and largely negative (Galatians and the Gospel of Mark) and another that is later and largely positive (Luke-Acts). Configuring the reception of the earlier, more difficult Petrine images as an issue of collective memory, I argue that the Lukan author functions as a reputational entrepreneur who simultaneously acknowledges the more difficult aspects of Peter’s reputation while recasting the apostle as a favourable, inclusive champion of inter-ethnic ideals. The study progresses in three steps. I begin by examining the issues and problems that prevent many modern scholars from reading Luke-Acts as an early receptor of the Epistles of Paul. I suggest the problem lies not so much in the nature of the sources but rather the critical methods employed in determining Luke’s reception of Paul. Accordingly, I suggest that Luke’s use of Paul is better configured in the context of collective memory and, with respect to the Peter figure, commemorative reputations. In part two I test this thesis, specifically examining the way Luke appropriates the Peter figure vis-à-vis the Gospel of Mark (one of his undisputed sources). Here I am particularly interested in commemorative rather than source-critical issues—that is, I examine the relative descriptions of Peter in these two Gospels, the alterations and/or retentions that characterize Peter’s commemoration, and the contours that define his figure. Finally, in part three I turn my attention to the image of Peter in both Galatians and Acts, specifically with respect to Luke’s reputational entrepreneurship and the ways he negotiates past and present with one another. In addition to contributing to the recent, critical re-examination of the relationship between the Pauline and Lukan writings, this paper explores the ways in which established traditions exerts pressure upon later writers in such a way that the past is not simply rewritten but rather functions to both form and inform the present.